Miso Crafty Knits: Imperial Yarn :: Review & Giveaway!! Imperial Yarn :: Review & Giveaway!! Back in September I had listed "rustic yarns" as one of my Obsessions for that month. And by rustic I had simply meant yarns that weren't superwash, that weren't overly processed and stripped of the fibre's natural properties and beauty, and that weren't blended with other fibres like nylon, cashmere, or both so that it can be marketed as a "luxury yarn" (although I did discover that the term "luxury yarn" means different things to different knitters depending on where you live!). I was on a hunt for yarns that met this criteria and for patterns that would mesh well with them. I was on the look-out for comfy pullovers, cozy cardigans, squishy cowls or scarves, and most importantly - warm mitts. But then life got busy and I had to put these knitterly plans on the back burner. During that time though, the über nice people at Imperial Stock Ranch sent me a few beautiful skeins of Imperial Yarn Erin to play with and to knit up a gorgeous pair of lace cuffs! I was seriously dying to get this yarn on my needles, as I've never knit with any of Imperial Yarn's yarns. It's only now that I've been able to wind up a skein and do some swatching! 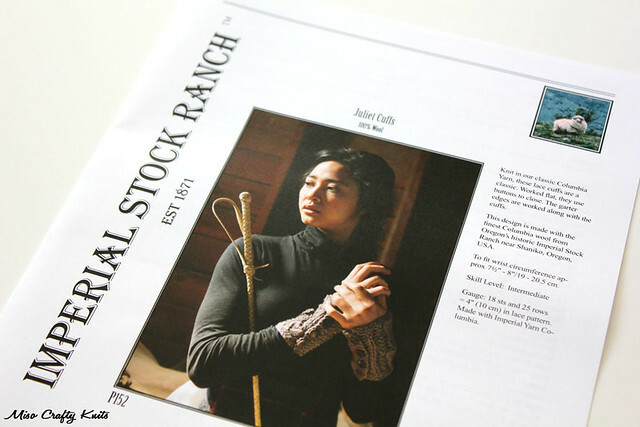 First off, for those of you who don't know anything about Imperial Stock Ranch or their yarns, they are a family owned and operated, American ranch and company based out of Shaniko, Oregon. The company highly values sustainability and are deeply proud of being a 100% USA-made wool product. The yarn that I was lucky enough to receive is Erin, which is a worsted weight 3-ply of 100% wool. When I first pulled the yarn out of the box I was immediately impressed with how light, lofty, and oh-so-squishy the skeins were. The yarn itself is beautifully round and balanced, and running a strand through my fingers the yarn is wonderfully soft and smooth. I wound up a skein in the Honeydew colourway, and let me tell you, that light melon-y green shade is not easy to photograph! I tried in so many different lights and backgrounds, using both my smartphone and my expensive camera and I still had such a hard time capturing the colour! The tag suggests using a 4.5mm (US 7) needle but I ended up using a 5mm (US 8) solely because I couldn't find a single 4.5mm needle anywhere! Which is weird, because if you know me, you'd know I have several sets of needles. So you know you've got way too many projects on the go when... Anyhoo, I knit up a simple stockinette swatch over 40 stitches for a few inches before deciding to throw in a few mock cables, a simple cable, and a lace leaf motif into the mix. So impossibly hard to capture the colour! Honeydew is actually more minty than this photo depicts! The stockinette portion was cushy and warm, and I have to admit I really liked the fabric that I was getting. You can just tell that this yarn would make great every-day-wearable sweaters. 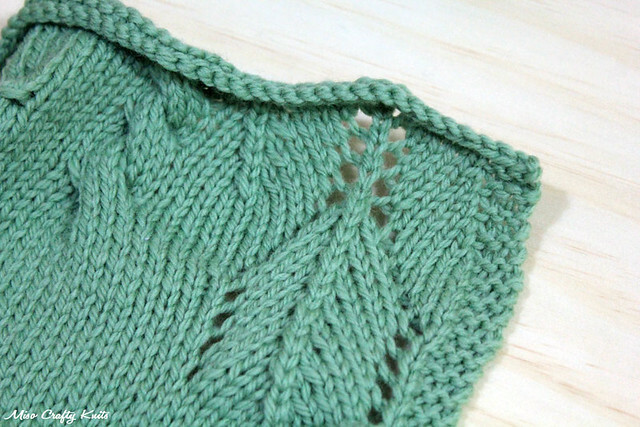 The yarn gives great stitch definition and was "sticky" enough to knit up the cables without the need of a cable needle. The yarn was quite a pleasure and so easy to knit with that I actually had made a pretty large swatch. So what do you do when you've got a fairly big piece of knitted fabric? You drape it around your neck of course! I wore the swatch around the house for a good hour or so, tucked into the front neckline of my shirt. I wanted to see if the yarn could be worn next to the skin or if I'll need a layering garment to avoid scratching myself silly by the end of the day. I was pleasantly surprised to find that after an hour I had completely forgotten that I even had the swatch tucked into my shirt! I was reminded later that day when I went to a coffee shop and the barista gave me a weird look and asked me if it was really that cold out that I needed to wear a dickey. Hm. Don't judge. Let's get back to the yarn. It was such a joy to knit with Erin that I was pretty excited to cast on for a pair of Juliet Cuffs designed by Anna Cohen for Imperial Yarn. Sadly, the day I cast on the first cuff I was already having issues with my knitting mojo and every knitting project I touched that day just didn't want to work out. After a few false starts I finally have the first cuff under way. I'm really hoping to get them done within the next few days as it's looking like it's going to get even colder around these parts, weather wise. I also better start looking for buttons since my MO seems to be that I don't finish projects that involves buttons simply because I just can't get my hands on the perfect button. And I may be a stitch lazy at sewing them on. But we won't get into that. Oh, hey! How about we talk about a giveaway though? Aside from the skeins that I was able to play with, the lovely peeps at Imperial Yarn also gave me a skein of Erin and a hardcopy of the Juliet Cuffs pattern to give away to one lucky reader! So now you can play with this delightful yarn too and maybe we can be twinsies in our cuffs! Who's up for that? I promise I won't show up at the same events as you wearing my cuffs, if that makes you feel any better (sorry, sometimes I get a little sassy when I've had too much coffee). If you're interested in snagging this lovely little package, keep on reading!! ♥ All comments must include a valid email address or Ravelry ID. Comments not containing either of these will be disqualified. I am not affiliated with the company mentioned in this post, nor do I endorse them and vice versa. I received no monetary compensation from said company for the review. The pattern and skeins of yarn were sent to me for review purposes but the opinions I've written are my own based on my own experiences with the products mentioned. I will not be receiving any commissions from this post. Ohhh I haven't used Imperial before but I'd love to be twinsies haha :) Looks heavenly!! The colors are so beautiful, and I can see how balanced the yarn looks. I would love to win! I've never tried Imperial Yarns before but after your review I really want to! I knit a hat (http://www.ravelry.com/projects/SheilaOKeefe/transit-of-venus-hat-2) with Imperial Columbia yarn. I just loved the yarn and have been dieing to try some of their other yarns. I love when you discover a new fabulous yarn! I think I would have to use this stuff for a hat, since hats are probably my most favorite thing ever to knit. Alisonesther on Ravelry! I've never had the pleasure of knitting with Imperial yarn before, but I'd love to try it. It looks so squishy and cozy! Whoops! Forgot to leave my Rav ID! It's vernalequinox. Well I've never, but you sure know I would love to. The pattern looks so cute and the wool looks beautiful. What a generous give away. I've heard a lot of good things about this company! I hope to try some of their yarns in the future! That yarn looks great, I'd love to try it! What an amazing prize I love the brown, it goes with everything. oohh This looks like a yummy yarn! Your swatch is very squishable! I haven't even heard of this yarn before, but it looks so cozy. I'd love to try it out! I've never tried their yarn but it looks quite cozy! Lovely! Sounds like a brand I would enjoy - haven't seen them around where I live, so I'd love to win a skein and check it out first-hand! LizJar at Ravelry: I am new to all of this and trying to figure out what is going on, so it would be great to win a prize of yarn for starters. It looks so lovely. I have not yet knit with this yarn. I like the idea of "rustic" by your definition. The yarn looks lovely, and I'll have to search some out. Unfortunately I have not knit with Imperial yarn before, but I'd love to try it! I wasn't aware of this yarn... but it looks lovely, for sure! I haven't used this yarn before. I'd like to try it for mittens. I have knit with Imperial before, but I can't remember with yarn exactly. It was a beautiful natural cream color and I knit up a cozy cowl. So beautiful. 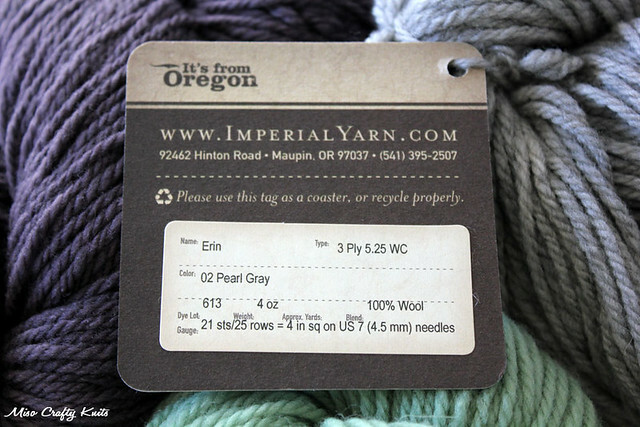 I love local Oregon made yarn!! This is beautiful yarn! I know I'm a crocheter, so I probably don't count. :( but I am dying to find a good yarn to make the Katniss cowl! Oops, no, I have not used this yarn before but I'd love to try it! I think I would make some sort of wearable accessory. I haven't had the pleasure of knitting with it yet, but I would love to! Fun giveaway. I love that the colorway is Quail - takes me back to my days of living in CA. alcbrooks on Ravelry if I should be so lucky! I have never used this yarn. Wonderful color and texture to this yarn! I checked the website for a store near me, and was surprised to learn of a yarn shop I didn't even know about here. KittenWhiplash on rav. It looks lovely! And who doesn't need that pattern?!?! rashooray on rav. Lets celebrate me being baaaaaack with some yarn. OH MY! lynnettelawther on rav. Yes please!!! nataliebknits on rav! Oh yes please!!!!! That would be fantastic! Rustic yarn is great to work with! Rustic yarns are my favorite...the less processing, the better I like them! 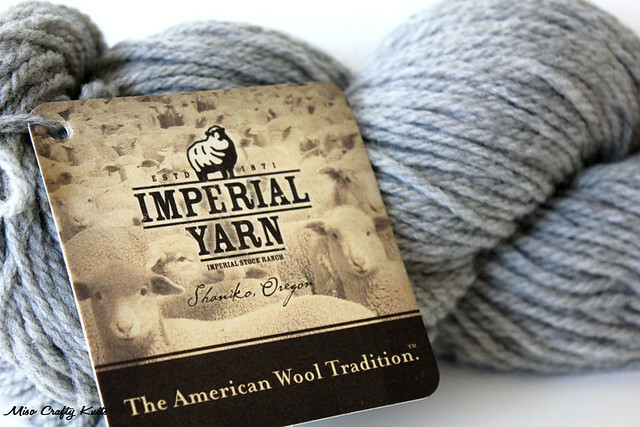 I haven't tried Imperial Yarns yet, but I'm going to in the very near future! They'll make wonderfully warm mittens for cold New England winters! I'm also more than happy to support an American company and wish them much success in the future! That yarn sounds great! It looks super soft too! I've seen it, but haven't knit with this stuff yet. I too really like pure/natural/rustic yarns. This one sounds intriguing - and the colour is up my alley! I love this type of yarn. A strong, hard wearing yarn that is so nice to work with. Their colours look beautiful too! Thanks for the giveaway! 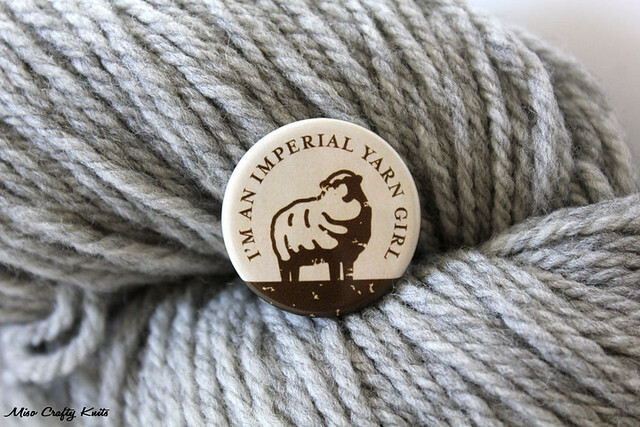 No,I have never used Imperial yarns before.I would make a scarf or a sweater. Yes please! I love the yarn and that pattern! I've been so interested lately myself in finding a "rustic", hard-wearing yarn that is also soft and lovely to knit with. Imperial Yarn has been on my list to try. I haven't yet. I love those cuffs! Oh! 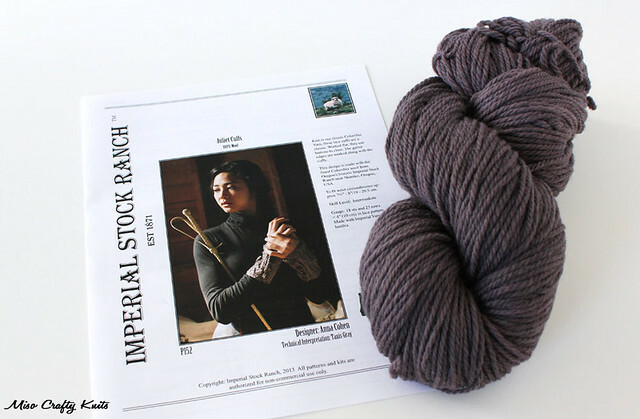 Imperial Yarn is on my must-knit list. I, too, prefer "rustic" yarns - not a fan of superwash. Knitting with Imperial Yarn is on my wish list for 2014. And their patterns are so appealing. This is a great giveaway. Thank you. I have never knit with Imperial Yarn but i'm looking to try! And those Juliet Cuffs are so very lovely! I'll give it a shot! I never knew about Imperial yarn, but it looks soft and cozy that I want to try it as soon as possible. I've never knit with it before but I am looking forward to it! Oh that yarn looks perfect for those cuffs! I've never knit with that yarn. I haven't knitted with this yarn before. I'm so curious! I haven't knitted with this yarn before. I'm so curious to try it out once. Ooh! I have never worked with this yarn, but I´d LOVE to, it looks yummy! Unfortunately I haven´t knit with it before. I haven't used this before, I just picked up knitting in August! I love to try new yarns so this would be fantastic. I haven't used it but I am looking forward to! I have never knitted with Imperial yarn before but I wanna. Oh it just looks so squishy and lovely! I would probably convert the pattern to mitts because with this cold weather I need some and I feel sort of lame, being a knitter and all, and not having mitts! 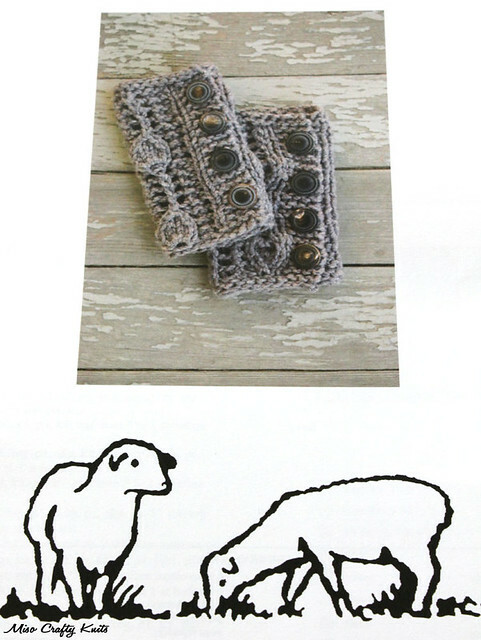 I have not used this yarn but I would love a chance to make some mitts with them. I knit some mitts last year with a super soft luxury type merino--they are soft and warm-but pilling and not so beautiful to look at anymore. Leaned my lesson on where to use soft yarns vs rustic. I ve bnever used this yarn before but if I have the chance to win I would like to knit a sweater for my son. hi where you put email here? I haven't used Imperial yarn, but it I'm loving sheepy yarns again, especially for things like mittens. There's a sweater's worth of Briggs & Little in my stash awaiting use, and I'd love to compare this! No, I have never used Imperial yarn. I would love to knit some scarves, maybe a hat or 2. Haven't yet used Imperial Yarn... but I've seen it and think it feels lovely!